Patagonia’s and REI’s public battles with the Interior Department over the reduction of two national monuments in Utah appear to have boosted the consumer perception of both brands, according to YouGov BrandIndex. Since the government’s announcement on Monday, Dec. 4, Patagonia’s consumer perception rose to tie its highest level of the year, where it still remains. Last week’s series of events began with Patagonia’s website’s stark message of “The President Stole Your Land.” Two days later, the retailer joined a series of lawsuits challenging President Trump’s decision to reduce the size of Bears Ears and Grand Staircase-Escalante. On Friday, the US Committee on Natural Resource shot back at Patagonia on its own Twitter feed. By the weekend, Patagonia reached its high mark. It’s notable that a prelude to Patagonia’s recent actions didn’t budge its perception at all: On August 20, it aired its first TV ad in its history, specifically taking aim at President Trump’s and interior secretary Ryan Zinke’s decisions regarding national monuments. Patagonia spent $700,000 on the spot, which aired in Utah, Montana, and Nevada. REI posted its own Twitter statement with a softer tone asking everybody to change their profile photo to a “We Love Our Public Lands” logo. While its perception rose, too, it began settling back by the weekend. The North Face didn’t receive the same positive reception as the other two. On the same day as Trump’s proclamation, it announced a $100,000 donation to Kickstarter for a Bears Ears Visit With Respect Center, accompanied by an op-ed on Quartz written by its president. Following that, The North Face’s perception actually slid back throughout the week, but began rebounding over the weekend. 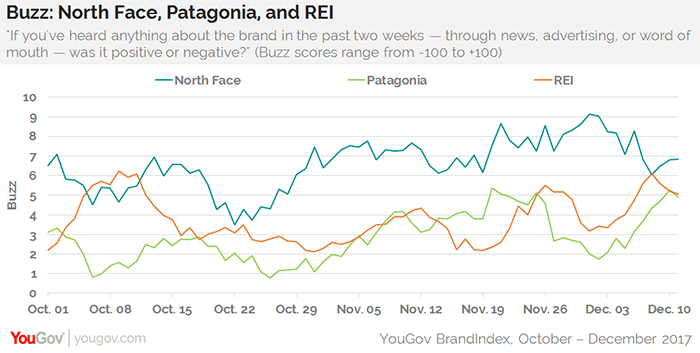 YouGov BrandIndex measured Patagonia, REI, and The North Face sector using its Buzz score, which asks respondents: "If you've heard anything about the brand in the last two weeks, through advertising, news or word of mouth, was it positive or negative?"